22611 was successfully added to your cart! 22611 could not be added as a favorite. Please make sure you are logged in. 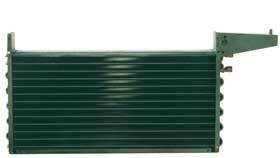 Condenser (only), bolt on, 26-1/2" x 12-3/4" x 3-1/4". Fits John Deere combine models 9400, 9410, 9450, 9500, 9510, 9510SH; 9550 w/o oil cooler; 9550SH w/o oil cooler; 9600, 9610; 9650 w/o fuel cooler; 9660 w/o fuel cooler; 9660CTS w/o fuel cooler; CTS.